This may be untrue for others, but it is a definite fact for me; I work better in brighter, cleaner spaces. I feel like my imagination and creativity can run wild to its heart’s content. Unfortunately, I don’t have a space where I can let my mind run wild with imagination and creativity to its heart’s content, simply because I don’t have a suitable, bright and clean working environment. Fun fact about Jes; I do most of my University work and anything blog related – and everything in between – in and on my bed. Yes, I know. Working in any shape or form in and on your bed is completely inexcusable. It shouldn’t be allowed, but I do. I do because instead of having an organised desk, I have a vanity filled with far too many cosmetics I don’t need anymore, and receipts that should have been thrown out a long time ago. That doesn’t mean I am going to throw away my vanity. No way. I am in love with that baby, but I will relocate it, and replace it with a desk sooner or later. For now, I am seeking inspiration in ways which I can decorate my own working environment. And these so far are my favourite in which I stumbled upon Pinterest – oh Pinterest, you’re amazing. Maybe this may inspire you just as much as it inspires me? Ahh my desk had become such a mess lately, it really does impact your creativity! I always seem to end up with my make up all over my desk despite having a dressing table. I love reblogging these kind of photos! You have all white furniture don't you? What a dream! Fortunately, I do. I am so happy having white furniture so it's exciting while on the hunt for another yet again white piece of furniture and having the opportunity to decorate it with tiny plants. I'm too excited about this. I need my own space desperately. I feel I will be more creative if I had one. 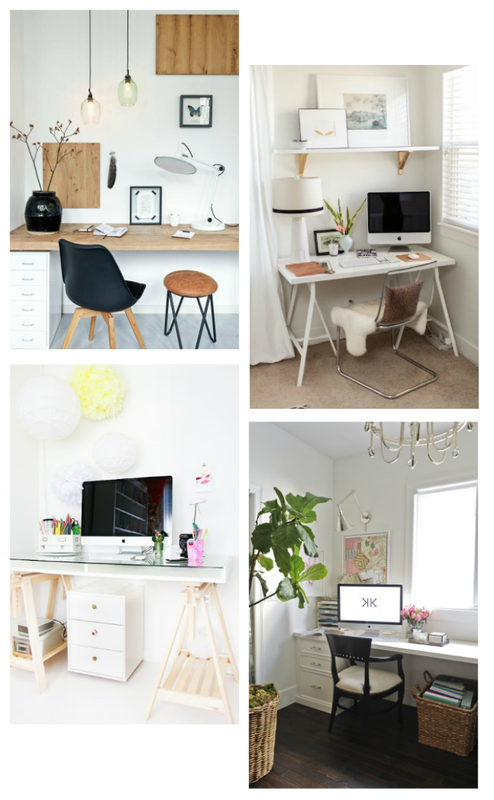 I love all those workspaces, is there anything better than a white desk?